US ▼ 2011-04-12 $29.99 ? (Playable Demo) 2010-02-08 FREE ? UK ▼ 2011-04-12 £14.99 ? AU ▼ 201x $? ? EU ▼ 2011-04-12 €19.99 ? DE ▼ 2011-04-12 €19.99 ? KR ▼ 201x ₩? ? US ▼ 201x $? ? US ▼ 2013-09-20 $3.99 ? EU ▼ 2013-09-20 €3.99 ? DE ▼ 2013-09-20 €3.99 ? UK ▼ 2013-09-20 £3.99 ? JP ▼ 2013-09-25 ¥400 ? Sonic & Sega All-Stars Racing (ソニック＆セガオールスターズ レーシング) is a racing game developed by Sumo Digital. It stars characters from a wide range of Sega games, similar to the previously released Sega Superstars Tennis, also by Sumo Digital. Unlike Sega Superstars Tennis, Sonic & Sega All-Stars Racing is more skewed towards the Sonic the Hedgehog franchise, with roughly half the tracks based on the series and appoximately one third of the characters. Its development was announced 28 May 2009, with the game being released in early 2010. It has so far been released for five home systems, including the Xbox 360, PlayStation 3, Wii, Nintendo DS, and PC. An arcade version of the game, titled Sonic & Sega All-Stars Racing Arcade and which runs on Sega's RingWide arcade hardware, was released in 2011. An iOS version was shown at E3 2011; this version is the only version of the game released in Japan. The game is very similar to Mario Kart in design - each character has a vehicle (ranging from cars, bikes and even planes) and competes across several themed tracks in an attempt to finish first. Along the way there are power-ups, which can help the player or hinder others. Some tracks have multiple paths, and many are littered with obstacles which serve to slow the player down. 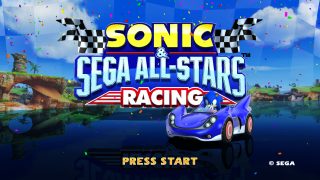 On 30 April 2012, a sequel, Sonic & All-Stars Racing Transformed was announced for all major platforms. A number of characters were once planned for the game but ultimately failed to make the final cut, often due to licensing issues. The reveal of Xbox-exclusive characters has suggested characters exclusive to the PlayStation 3 version of the game may emerge in the form of downloadable content in the future. Several characters were confirmed to have existed in the game's development timeline at some point. Mario. Briefly considered to be a Wii exclusive character, Nintendo and Sega agreed that Mario/Sonic crossovers would be best suited in the Mario & Sonic at the Olympic Games franchise, so the character was not added. Segata Sanshiro. The martial artist mascot of the Sega Saturn was revealed to have been discussed at one point with his vehicle being a Sega Saturn. Concept art is said to exist, but never made the final character roster. ToeJam and Earl. Disputes with Mark Voorsanger, the creator of the duo meant that insufficient time was left to include these characters. Fan feedback has since prompted a rethink on Voorsanger's part, who decided to ask Sega again on the matter. No word has been spoken on this issue since. Gilius Thunderhead. Discussed at an early stage of development, the Golden Axe character was scrapped for unknown reasons (he had previously appeared in Sega Superstars Tennis). Supposedly he would have ridden on a Chickenleg monster from the series. He does appear in the game's sequel, Sonic & All-Stars Racing Transformed. Vyse. This character from Skies of Arcadia was briefly in an interview, but was never mentioned again. He does appear in the game's sequel, Sonic & All-Stars Racing Transformed. The Sonic levels are based on stages from Sonic Heroes. Sonic & Sega All-Stars Racing has many console-specific features though the core gameplay is retained across all ports.The Xbox 360 version has the extended title of Sonic & Sega All-Stars Racing with Banjo-Kazooie as it features Banjo and Kazooie from the Banjo-Kazooie series (which are now exclusive to Microsoft consoles). The Xbox 360 version also allows users to play as Avatars, while the Wii version allows the use of Miis. Both the Xbox 360 and PlayStation 3 versions can benefit from downloadable content. The console versions of the game supports up to eight-player online play as well as four-player split screen multiplayer. The PC version only allows local split-screen races, presumably due to fears of players hacking their statistics, however online multiplayer was later added to the Mac OS X version. "Bandwidth issues" prevent players from using All-Star power-ups online. The Nintendo DS version has several stages that were changed from the console versions, most notably in Carnival Town. 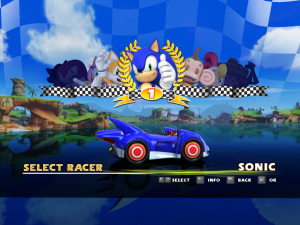 While all racers are playable, they have been altered so that there is only one character per vehicle. Jacky's All-Star move is changed to reflect this. Most of the music was also remixed by Orchestral Media Developments, unlike Sega Superstars Tennis, where the music was mostly the same as it was in the console versions. It also only supported up to 4 players online and has support for DS Download Play, although when using Download Play only the characters and courses that are unlocked by default can be selected, and are chosen for both players by the host before any data is sent to the client. This version was used as the basis for the later iOS and Android versions. There was also a version for J2ME phones developed by Gameloft. This page was last edited on 20 April 2019, at 12:09.